Make your move in the SL New Year's rengo for 2002! Make your play on main board and circle it (unmarking the previous play). Also, make your play on the numbered board, and leave a brief note identifying yourself and your play. Every 10 moves we have to start a new numbered board. For how it's done, see Ongoing Game. Enjoy! Lucky: I think there is no point to finish this game. White is ahead by more than 20 points (including komi) and there is nothing left to fight on the board. 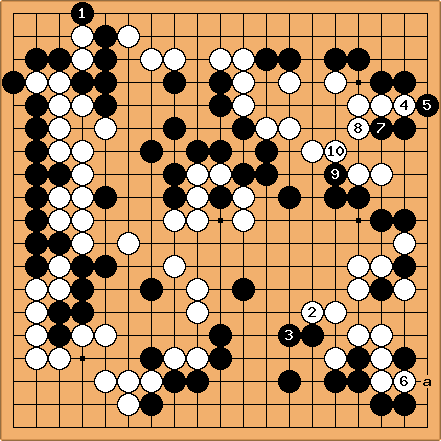 It should have been more close but black sacrificed too many stones on the left, near the white wall. Any suggestions for an interesting name for the next game :-) ? Lucky: W180. Just helping to finish. unkx80: B179. Yes, methinks that Black need another move. DaveSigaty: W178. It seems to me that Black needs another move here. HolIgor: B177. It seems to me that this is sente. DaveSigaty: W174 draw the boundaries in the center. ChessWhiz: W172 - Can't allow Black to cut here. Playing at a just doesn't quite work. Lucky W168 let's use the sacrifice stone. DaveSigaty: B167: too big to ignore but now Black is troubled by damezumari. HolIgor: The stone is lost anyway, so could not it be possibly better to play at a first? Later this possibility might be lost. unkx80: Actually my intention in playing Black 163 is to follow up at b with sente, so that if White plays at c then Black plays at 166, if White plays at 166 then Black plays at c. But the difference is not that big anyway. DaveSigaty: As long as Black does not get to play 166 there is no effective play here. If Black played a instead of 167, White would capture at c. This threatens to play atari at 167 and then push again at d in sente so Black is almost forced to answer at d. White does not need to answer a at this time. 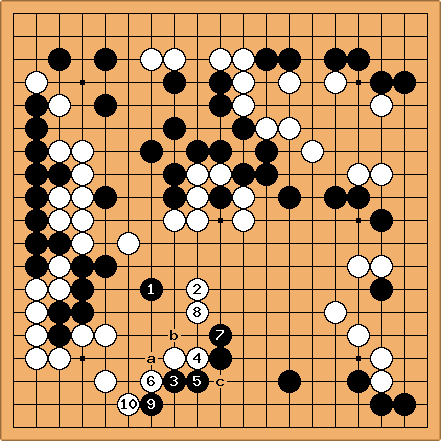 Although Black 161 created a nakade in the middle of White's big eye, it made it impossible to prevent a second eye along the top in sente because of Black's damezumari. It seems that Black had to be content with reducing the top edge and letting White make a living shape with the big eye. It was difficult to do this in sente with the cutting stone hanging at the bottom however. The move at 158 was effective in this regard because if Black does not play 161, White can do so instead, extending the eye space and creating the damezumari problem anyway! Unfortunately, being behind, Black needs to do too many things at once :-) But being behind anyway, maybe the only thing Black could do was play 165 at 166 and play f in order to fight the ko if White used 166 to capture at the bottom. dnerra: Dave, I am not quite sure whether your comment is just a reply to HolIgor or also to unkx80. I agree with unkx80 that b would be a nice follow-up here. 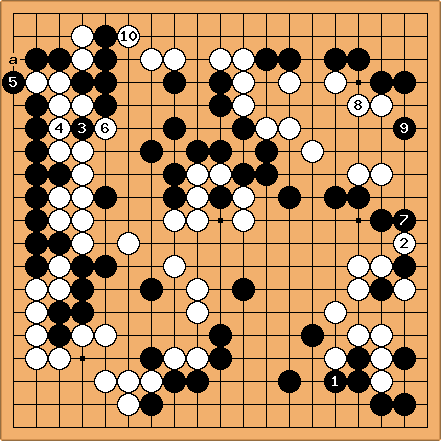 I would further expect White 166, Black c, White g, Black 167. Then White has to defend at f. unkx80, I don't know what you would consider big?? :) I'd say the difference is at least 3 points, this is quite a lot at this stage of the game. However, I think it was very easy to overlook that it was a double sente situation here. DaveSigaty: You are right, I did not really appreciate unkx80's comment when I replied. Note however that in all these lines White will play h before playing f. This looks like it prevents Black from connecting under at i which is worth a few points. dnerra: White 166. As the last one was obvious, I may be allowed to play another one. HolIgor: Black 165. Black has to somewhat reduce the price at the bottom. I chose this direction though this loses some points for sure because I don't like the idea of White making forcing moves in the centre. dnerra: W164. Hopefully also an easy one :-). unkx80: B163. Still looking at sente plays. AvatarDJFlux W162: I choose an easy one (hopefully...) to play again in this game. HolIgor: Honestly, I don't know what is going on. Can you explain this to me? I thought that I'd exchange Black 157 for a before playing at the bottom. That would win a trifle for Black. 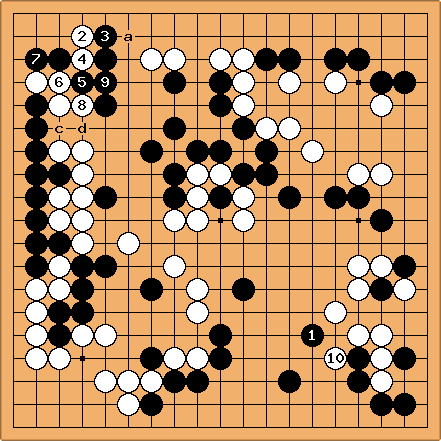 Now it seems that White replied and Black gets even more points to grab. I have to think about this. Can it be that now black moves are not forcing anymore? If that is a trap then don't tell, of course. Lucky W158. White has to be careful, Black 157 is a strong move. HolIgor: B157. It is possible that I misread this, but as Black has lost in any case, one has to dare. dnerra: W156. Let's have Black commit to either of the two possible ataris. Lucky: W152. This is miai with Black 151 though a little smaller. unkx80: B151. To prevent White from playing the atari at a.
HolIgor: B149. One more push. dnerra: W148. OK, I'll buy that this is sente. unkx80: B147. No doubt a is big, but I'll push first. HolIgor: B145. This is kind of obvious. HolIgor: B143. Black has to protect here in my opinion. Otherwise the next white move can become too forcing. Aboout the score. Did you count komi? I think that White is leading by 12 points. Arno: oops - yes, I forgot to count komi. So I agree, White is about 10 points ahead. dnerra: W140. Here's another eye. Lucky: W138. Time to make eye. HolIgor: B133. I seems to me that White a was pure sente. Black wants to connect on the first line and with this move it is likely sente. Though I misread a zillion times during this game. DaveSigaty: W132. I don't know what is best. I think this is a reasonable move before trying to fix up the top group. HolIgor: B131. Black does not want any aji and White has to return to connect later. But White is about 15 points ahead at the moment. dnerra: W130. I want Black to decide on the answer on this one. HolIgor: B129. Black has no choice other than than to end this in gote. I think that the game is over now. The only reason to continue is to play the endgame for the endgame's sake. Sorry, I played Black 123 because I thought that Black had to fight to have any chance in this game. Otherwise playing 123 at 6 would be sente at least. unkx80: B127. The one-way street continues. 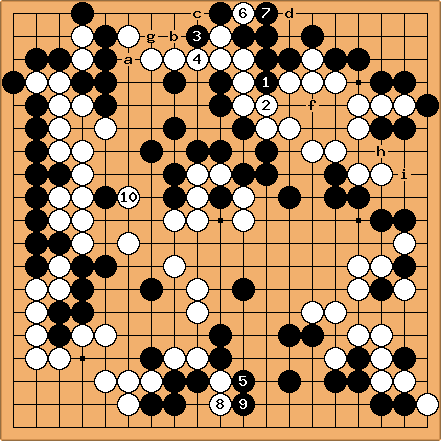 HolIgor: In my opinion Black 125 should have been at c. Otherwise Black would not bother with 123. 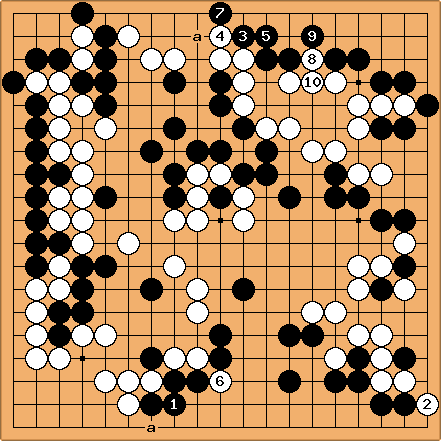 Playing c and d Black would have killed the white group in the corner easily. Or I don't get something. dnerra: White 124. It may or may not work to play at b instead. But it would definitely give up sente. HolIgor: B123. Let's see what good players invented. It is interesting that if White played at a Black would not, probably, reply. Lucky: White 122. This move was postponed a long time. Maybe this is the moment. HolIgor: Black 121. 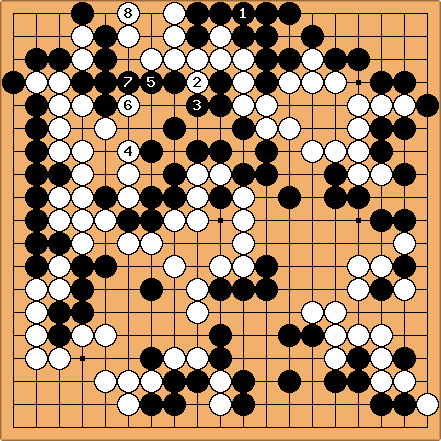 In my opinion Black cannot allow White to expand in the center, pressing Black's position down. That would decrease Black's land and give white some points in the center. HolIgor: Black 119. To prevent White from enclosing this territory easily. dnerra: Seems the most beneficial way to protect the cut. HolIgor: Black 117. I thought White could block. But if White decided she would not, then Black is not interested in a monkey jump anymore, so 7 becomes possible preventing pressing Black's position down. Well, I don't believe that Black can kill White's group, so it is yose now. Lucky: White 116: White cannot block now, can she? Arno: Black115: Let's see how this turns out. Black 113 is in a good position now. dnerra: White 114. 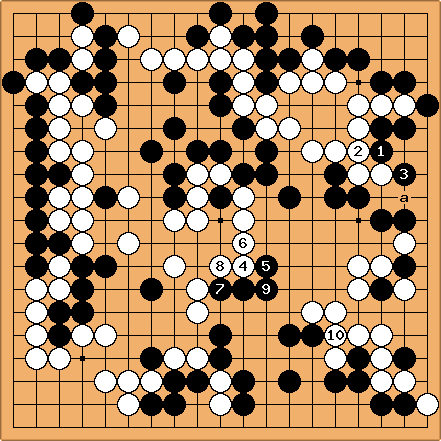 This may look submissive, but...I think there are good reasons to prefer this move over d.
HolIgor: Black 113. It is hard to give up all those stones but if Black does not do something White can become unbeatable in the centre. It is obvious that White knows that the correct reply to c is at 114. If Black plays 114 first the escape is too difficult. So, I think that Black has to make a reducing move like this in the centre and switch to the top and to the right side. ArnoHollosi: White 112. As pointed out, I don't think Black's cut works. Therefore I connect. dnerra: Welcome to the team, Arno! :-) By the way, if Black plans any ataris on the two stones or the a/b exchange, I'd say feel free to add the obvious white answer plus the follow-up (whoever plays the next move). HolIgor: I am sorry. Moreover, the sequence did not work. HolIgor: Black 109. This move is an indirect protection against the cut at the point c.
In order to finish the game this year I will make moves more often. We still have about 150 moves to go. As before, I am a dummy player for Black. Feel free to correct my mistakes before the opponent replies. Lucky: White 108. Must defend. HolIgor: Black 107. Shape point. HolIgor: Black 105 is forced. Answering the question: press once and then retreat does not seem natural to me. dnerra: I thought about playing at 106 with 104, but was too afraid of white pulling something off by answering at b. I agree that 104 is bad shape, but I don't see any good shape move working well here. AvatarDJFlux White 104: May I force once before going back? HolIgor: Black 103. I am very sorry for my 95. I counted and saw that Black is about five points behind, so I played an insolent move in hope that White would be scared. But it turned out badly: Black lost several points more. I don't think that Black can escape. Even if they escape they will not be able to escape with a cut. So it is time to try and squeeze something of the enemy using those stones. I return to the move proposed by Arno. I think that Black is about 12 points behind now. But the game is worth playing because it has some interesting points on the right and at the top. DaveSigaty: Although (or because) I played 94 and 96, I was not at all sure of White's position here. What would White have done if Black had attached against 102 with 103 as shown here? dnerra: HolIgor, I am not sure whether your moves were really bad. But I think it is a (very common) misconception that you should start trying overplays just because you are five points behind. (I don't think this count is right by the way, there were too many weaknesses in the center that would let Black reduce the center in sente, plus there is still that tesuji sequence on the right side.) We are amateurs, and you can be sure that the sum of mistakes either side will make from here one will surpass five points by some multiples. Go is a game of patience, your opponent usually gives you enough chances to win the game. You just have to wait for them! Lucky: White 102 - OK, I'll play the obvious move. Arno: Black 101 - someone stop me, please! That's the third move in a row, which I have made. Feel free to delete my previous two moves if you don't like them. Arno: Black 99, White 100: playing two moves in a row, because White 100 is forced. If anyone objects you are free to correct White 100.
dnerra: White 98 -- no choice here. ArnoHollosi: Black 97: cut. Is there any other move on the board? :o) To me White 96 is a clear invitation to cut. After some (shallow) reading I don't think that this is bad for Black. We will see who has to give in first. DaveSigaty: White 96. It would probably be polite not to make two moves in a row but this game is moving pretty slowly. I refuse to connect against both 93 and 95. Besides, if I really doubted 93, now is the time to get tough. In reply to Arno's thoughts, I think the situation is too complicated to analyze successfully (besides this seems a little against the spirit of a Rengo ;-). We have to just plunge in and see what happens! HolIgor: Black 95. I am making the next move. As I said before, I am dummy in this game. I play whereever I like and Arno has a chance to change the move if he sees it before the opponent replies. ArnoHollosi: I think this is another crucial moment in the game (proof: no one dares to play the next move :o). I'd really like to discuss possible moves and implications. I start off with d: it gets Black a nice chunk of territory at the bottom, but cedes the center to White. 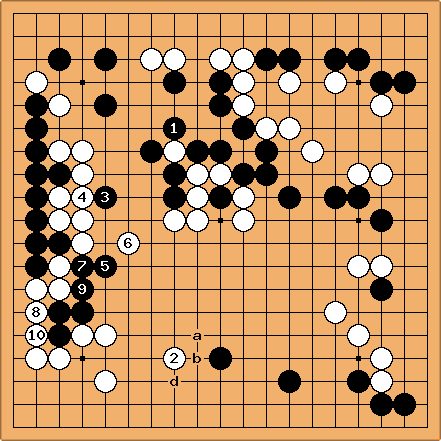 Shouldn't really be a problem, because as long as he finishes in sente (which is likely), Black can then turn to the weakness at 7 or reduce the moyo from 93 onwards. DaveSigaty: White 94: I am not sure of the value of 93. I am looking at the aji of the cut at 7. Is Black better or worse off after the 93-94 exchange? HolIgor: I have to admit that 91 was a hasty move. There was some aji there but as Black could connect the groups it was all just about points, and perhaps playing a large move at the bottom was better. At the moment I estimate the score in White's favour if Black cannot sqeeze something out of the attack of the right group. Black has a territory on the second line, which cannot be good at this stage of the game. Meanwhile I make my "dummy" move. It is a kikashi this time, so it cannot be too bad. Or is it? Will White sacrifice? dnerra: White 92 - I also seriously considered a, but that seemed to lose more at the bottom than it gained in the center compared to White 92. If this wasn't a rengo but my own game, I would feel irrationally tempted to try out b - maybe I should pretend to be playing rengo all the time? HolIgor: Black 91. Black connects. White managed to get sente but the moyo is not sealed at the top yet.